Big Mulberry Nursery was founded in 1999 by Tony Mehan & Joseph Bearden. Our goal has always been diversity and to offer quality plants at the very best price. 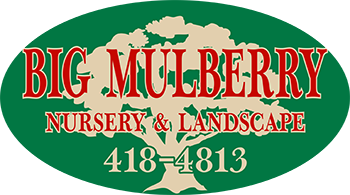 Big Mulberry Nursery specializes in landscape plants & trees for the wholesale landscape to the retail homeowner. Wildlife plants & trees for landowners has become a popular item within our nursery. We grow native and nonnative varieties of plants along with many varieties of fruiting plants that crossover from wildlife plants to home gardens. Most all plant material is propagated and grown from our own plants on sight. Residential landscaping is also another part of our business that has grown through the years. We are located 9 miles east of Selma on highway 14 or 30 miles west of I-65 in Prattville. Stop in & see us!